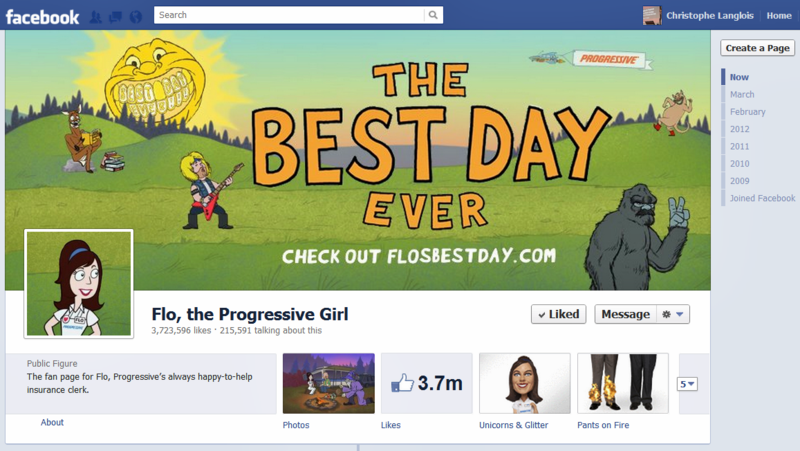 Progressive insurance engages with Flo’s millions of facebook fans in the US via twitter and instagram with their latest social media campaign Best Day Ever (#BestDayEver). Once more, Progressive Insurance leverages the immense popularity of its fictional character Flo, the Progressive girl. Over the years, Flo has built a community of 3.7 million americans via its dedicated page on facebook, an engaged audience 85 times bigger than Progressive’s own facebook community. This time, the campaign which aims to generate a significant amount of digital buzz and drive the volume of requests for free insurance quotes, taps into twitter and instragram, and focuses on photography and music. Progressive launched a dedcated micro-site ‘ http://www.FlosBestDay.com‘. I invite you to watch the video which has already been viewed more than 37,000 times. According to Progressive’s digital agency “the campaign is not to drive retail sales, but awareness and brand equity” and “the campaign is designed to engage users on the social Web in conversation and engagement around Flo, the video, and the Progressive brand”. It is interesting to point out that Flo’s facebook page was originally launched by fans, and it is only about 18 months ago that the insurer started to own and manage the page. Please note that the leading US-based insurance firms have invested a lot of time, resources and money on facebook which proved ‘successful’: Progressive, Allstate and State Farm all made our Top 10 most followed financial institutions in our Visible Banking Twitter Watch series (we track over 1,700 accounts in 78 countries). This twitter campaign is purely focused on brand and marketing, so we are far from the brilliant, business-driven, American Express’ Twitter Sync‘, but who said that a financial brand, let alone an insurer, couldn’t be ‘cool’? Previous articleSocial Customer Care: No Way Back. Pandora’s Box is Open.